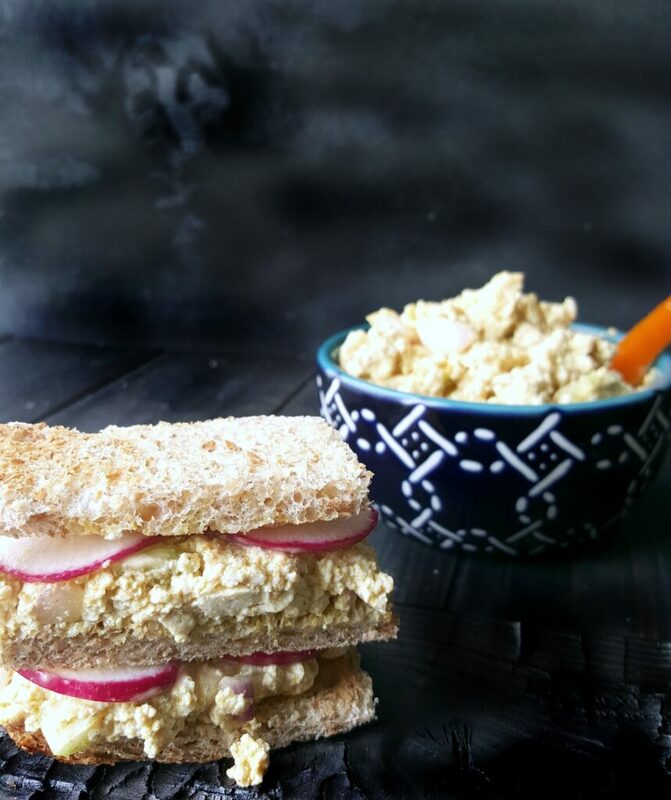 This creamy “egg” salad sandwich is made in minutes, using tofu instead, keeping it egg-free & allergy friendly. Protein packed, easy to make and quite egg-cellent. A little over 9 years ago, I found the hope I needed, that I could still cook wonderful foods and delicious desserts without the use of dairy or eggs. There weren’t very many “allergy-friendly” books or information available back then, but what I did find, was some amazing Vegan books that changed my way of thinking and also changed how my family eats now. Although we changed our diet out of necessity for the most part, it was still difficult in some ways because there were foods I had grown up with and loved that were now, literally, “off the table”. Egg salad was actually one of those foods for me. I remember my mom peeling the hard-boiled eggs, chopping them in her hand (KIDS, don’t try this at home! ), then dumping them into a bowl and mixing with mayo, celery & spices. I use to LOVE those sandwiches, especially on soft, white bread. That was some good stuff back then. But when your child is allergic to eggs and you watch 1 too many PETA videos on the egg industry, well, alternatives MUST be made. Thankfully, TOFU makes a great alternative for Egg Salad! It is NOT a soy-free option, so keep that in mind if you have a soy allergy. It IS however, free from the other Top 7 allergens. 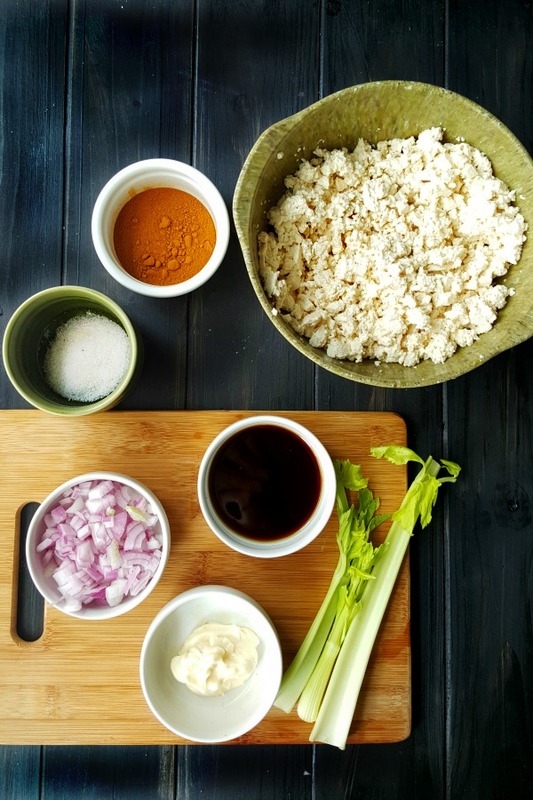 This is everything I used to make my Eggless Salad Sandwich. Looks pretty close to egg salad, doesn’t it? What’s crazy is that is actually tastes like egg salad too! Especially once you add the turmeric in there. All you need to do now, is decide how you want to plate it up! Maybe you are throwing a little party or get-together,,,,if you are, then cute little tea eggless salad sandwiches would be perfect. You can even dress them up by adding some extra veggies like thinly sliced radishes, smashed avocado or sweet red pepper strips. My daughter loves just scooping out the salad and eating it on her favorite crackers. Such an easy lunchbox idea, and healthy too! Be sure to include some fresh fruit and water to round out the meal. If you’re looking for sometime a little heartier, then you’ll want to pile up your bread with your eggless salad on top and make a sandwich out of it! Of course you can still be creative and add your extra toppings if you’d like. Lettuce, sliced veggies, spicy Sriracha mayo or crushed red peppers are a few of my favorites! Sprouted or Gluten free Bread, crackers, tortilla wraps. Drain liquid from tofu then add tofu cake to a medium-sized bowl. Mash with a potato masher (or fork) until chunky. Add diced onions, celery, tamari, oil turmeric & sea salt. Mix well. Stir in your vegan mayo. Refrigerate until ready to use or start to plate using below options. Serve open-faced on top of toasted bread with a sprinkle of chili pepper flakes. Make tea sandwiches and slice off the crusts then cut into 4 small triangles. Serve along side crackers of choice. Spread in tortilla, with greens & sprouts. I feel like we ate a lot of sandwiches growing up. What about you? What was your favorite or most eaten sandwich as a child? What do you typically pack or make for your weekday lunches? Delicious! I wish I could eat tofu! 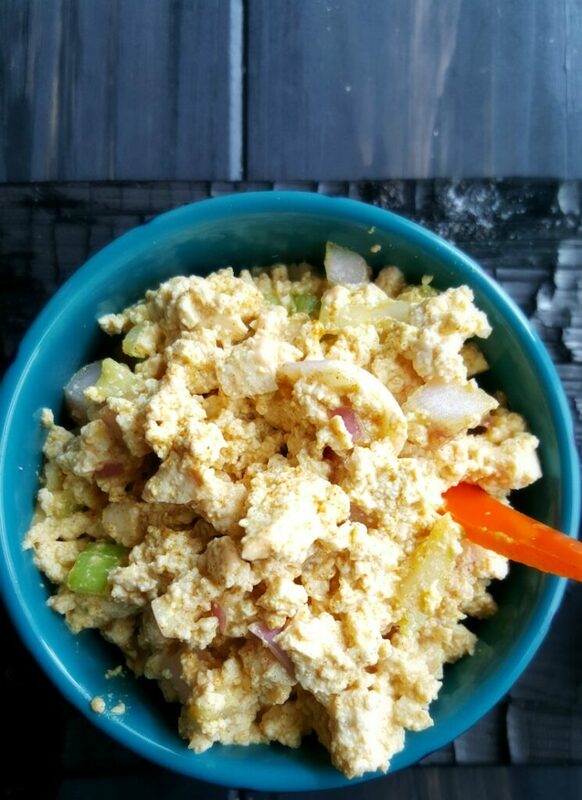 I LOVE tofu “egg” salad! Yours looks incredible. Such a perfect lunch! I make an egg free salad with chickpeas, I love that you used tofu. I bet the texture is spot on. Can’t wait to try this! Ooh yum, I am so excited to try this out! I was a huge egg salad sandwich fan, and haven’t had one in forever – this sounds amazing!! What a lovely sandwich filling. I don’t eat sandwiches often but next time I do I would love to try this. Thank you Mel. I don’t each much sandwiches either, but a wrap, or sprouted crackers also also a great option. You could even use it as a filler in celery or red pepper cut in half for a completely grainless meal. WoW, this looks amazing. 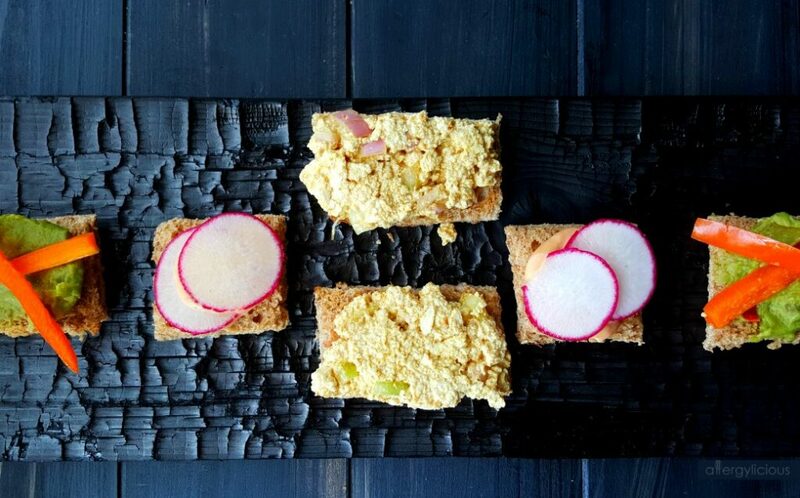 I have to say, I’ve eaten Tofu scramble couple of times but never thought of using them in Egg Salad Sandwiches. Great Idea. Thanks Molly, I think you’d really like it! Looks delicious:) never thought of making this salad with tofu!! This looks quick, easy, healthy, and delicious! My type of sandwich…love the use of tofu in this! Thanks Anjali, You have some pretty awesome sandwiches on your blog too! I’m off eggs and dairy too, so I love that there are so many healthy work-arounds. This one sounds perfect! Agreed! It’s so much easier than it was when I first changed up our diets. Hope you like it as much as we do. i had no idea tofu could be used this way…i will definitely have to try this for lunch soon. Can’t wait to hear what you think. I don’t think you’d ever miss having eggs this way again. I’m so happy to come across this recipe!! I love egg salad but I’m trying to cut dairy and eggs out of my diet, so… PERFECT! But I’m curious how long does this typically keep once refrigerated? Hi Delaney, I’ve only kept it about 4 days refrigerated. I may last longer but it’s usually eaten within those first few days. I have missed egg salad and this is spot on! I may mix it with chickpea to gice it an extra protein boost! I did make this eggless salad but added finely diced carrot for a little crunch. It is so good. I have a 8 year old grandson with multiple food allergies. I’m glad to find your website, it has many recipes for me to try. So glad Crystal and love the added carrots!